What Would Compensation Be For Edwards? As we mentioned yesterday, it appears that Ray Edwards is not planning on being a Minnesota Viking for another season of football and perhaps for good reason. For well over a year, the Atlanta Falcons have been rumored to be interested in Edwards, as defensive end is one of their biggest needs as they aim for a Super Bowl. The Falcons didn’t address the need in the 2011 Draft but instead sold the farm (and then some) to obtain wide receiver Julio Jones. They gave up their first rounder, second rounder, and fourth rounder from 2011 and their first rounder and fourth rounder in 2012. Keep that in mind… they do not have a first round pick in 2012. So, back to Edwards, he has made it clear he will not play for the 1-year, $2.521 million offer he received when the Vikings tendered him as a restricted free agent. So, if Edwards is restricted when free agency begins (depends on labor resolution), and the Falcons do indeed pursue Edwards as they are expected to, what would the Vikings get in return? According to the Daily Norseman, the Falcons could sign Edwards and if the Vikings chose not to match the offer, then the Falcons would not have to sacrifice their 2012 first rounder because they already did to land Jones. Instead, says the DN article, the Vikings would get the Falcons 2013 first round pick. Given the Falcons’ willingness to dish out the dough and part with picks because they feel so close to a championship, this could be a plausible scenario. Of course, it is also possible that Edwards becomes an unrestricted free agent and teams would owe the Vikings nothing in return for Edwards. However, they would likely be awarded a 2012 compensatory pick (depending on who they sign in 2011 and a bunch of other factors) which could be as high as a third rounder. Edwards has 182 tackles, 29.5 sacks, 11 passes deflected, six forced fumbles and two recoveries in his five seasons with the Vikings. He also has 153 missed tackles, 35 missed sacks, 57 stupid penalties, 18 missed fumble recoveries, and 45 annoying quotes in his five seasons with the Vikings. It is sad when someone’s talent and intelligence are not at somewhat equal levels. YUCK! please move on ray and don’t let the door hit you in the A**. I’m with you Fran, YUCK! Dude is a real perv, I wouldnt want to be in the locker room with him. I’ll bet his teammates always kept a firm grip on the soap when he’s around.lol! agreed guys….oh, and take big mac with you…..guys like this are the exact opposite of what people say on draft day, “players that absolutely LOVE the game of football”….. I still don’t understand how as a player you can’t love the game. Ray Ray is over here crying about making a few million dollars. I would gladly play in the NFL, for $30,000 per season if they let me! I’d do it for free, just to have a chance on special teams! Not only does he get to play America’s greatest sport for a living, but he gets to be a millionaire. I’m confused as to how he is unable to provide for his family on that salary, unless he feeds them molten gold sprinkles with diamonds for every meal. I hear you Zag so would I. But people seems to be greedy. (just look at the lockout)when they got some they want more. Lets face it Money talks more than love for the game apparently. Ray Ray is fighting a dude that is 5’9 when he is 6’5 and not only that but Ray out weighs him by 45 pounds? Come on now Ray! No disrespect to his opponent but that is crazy. As you well know, Freds, its not the size of the dog in the fight… its the size and number of his buddies standing nearby. can the sports writers of the world go one freakin’ hour WITHOUT A QUOTE FROM REX RYAN, PLEASE!!!!! Where? I looked over their front page again and I am not seeing that at all. I wondered if that was the case at one point, but took DN’s word for it. Let me know what you found? It was an edit to the original post. If and when free agency starts, I know where I’d be looking if I needed a big time defensive end. Operating on a defensive line full of stars, Edwards has at times flown under the radar; but, he’s always produced. The 26 year old had another great year in finishing seventh in our defensive end rankings, continually getting pressure. I for one am looking forward to seeing what he does without Jared Allen or Kevin Williams lined up on the same side as him. Key Stat: By picking up pressure on 16.59% of passing plays, he was the third most efficient pass rusher in the entire league. The stats of missed tackles and penalties above are rubbish and childish. Ray has been pretty good about his contract IMO. He did not say one word until his contract expired. He did not say anything when Jayme Mitchell was paid more in 2009. It really is puzzling why the front office did not get him signed prior to the end of his 4th year. They did for Cedric Griffen and EJ. So why not Ray? Curious. Now they are trying to say they want to resign him. Yeah right. Ray should hold out as long as possible. In the end it is all about the money. He is one play away from never playing again. Ray deserves more respect from the fans but as usual as soon as a guy speaks up about his contract he is the “bad” guy and “runs his mouth”. Typical selfish fans. Ray is a stand up guy in my book. He fulfilled his original contract that he signed. He never said diddly until the contract expired. The Vikings took advantage of the CBA and uncapped year rules. Many other teams took care of their RFAs like Kansas City with Derrick Johnson and Jamaal Charles. The man deserves to be paid as an above average LDE. He is not top of the line yet but he is above average. No two ways about that. The Vikings front office is responsible for this situation. Not Ray. He did what he signed on the dotted line to do. Now they stand a chance to lose him for nothing. And don’t talk about compensatory picks because many of you would expect the Vikings to sign a free agent or two or more of their own. Can you say safety? That would more than likely cancel out any compensatory pick. So this front office that is beyond reproach for some of you sheep, is in the position of losing this pretty damn good LDE that will get signed by another team faster than you can snap your fingers for nothing. Does that sound like a good ROI? Why didn’t they try and trade Ray last year before the trade deadline to a playoff contender? They MAY have been able to get a 2nd or a 3rd round pick in return at the least. Since they drafted him in the 4th that would have been great. What will you dudes say when he leaves and the Vikings get nothing in return? Will it be Ray’s fault? Look at the front office and ask how they can even let it get to this point? It is always the same though. Whenever a brother speaks up about his pay he is a bad guy to most of the fans. If I am Ray, I am holding out until the 10th week of the season at the least. Maybe the whole year if he thinks there will be a new CBA. Last year, he felt the same way. But he went out and performed very well according to the stats. He deserves to be paid and is absolutely 100% right! Quit hatin on Ray and ask what the men that are leading our Minnesota Vikings are doing? GMs and coaches do get fired. They are not all really smart. Sometimes they are dumb! 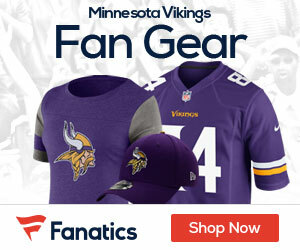 ARDEN HILLS, Minn. (AP) — A Ramsey County commissioner involved in talks to bring a new Minnesota Vikings stadium to Arden Hills says the team and county are very close to reaching a deal. Commissioner Rafael Ortega tells the St. Paul Pioneer Press the biggest issue remaining in negotiations is transportation. Ortega says Vikings owner Zygi Wilf and the House and Senate transportation chairmen were among those gathered Thursday at the state transportation building. They poured over maps and highway documents and discussed which roads and interchanges would need improvement and how much it would cost if the new stadium is built at the former munitions plant site in Arden Hills. Hennepin County Board Chairman Mike Opat Thursday abandoned his pursuit of locating a stadium at the site of the Minneapolis Farmers Market. I’d be upset too if I was in his spot. Compared to other DEs we’ve drafted he’s been pretty productive. Kind of disappointing the team ruins a relationship with pick that actually turned out to be good with even more potential. Yeah he’s got a mouth, but he’s an NFl player. On defense. I have agree that it is time to allow Ray Edwards to move on, once a player become as disgruntle as Ray has become it time to move him hopefully when they lockout ends we will be under 2010 rules as far as free agency goes and a team that has a losing record signs him so we can get their first round pick next year. This is how Bill Billicek and the Patriots are remaining competitive year in and year out. Getting compensation for good players via free agency or trades is the way to do business in the NFL today the blue print is out there its just time that we execute the game plan. Lets Go Vikings! I was suggested this website via my cousin. I’m now not certain whether this publish is written through him as no one else know such exact about my problem. You’re incredible! Thank you!